Posted on Tue, Dec 7, 2010 : 2:18 p.m.
For 30 years, host arwulf arwulf has led the adventurous, experimental radio program "Face the Music" on WCBN (88.3-FM), the student-run radio station at the University of Michigan. A special public broadcast at 7 p.m. Thursday is planned to mark the milestone in style. During the broadcast, arwulf and U-M student musicians will present "Beyond the War Model," discussing concepts and lessons from the three decades he has spent with the weekly show. The program will be broadcast live from the University of Michigan Museum of Art, and the public is welcome to attend. WCBN-FM Ann Arbor presents arwulf arwulf and the modified starch ensemble on December 9, 2010 at 7 p.m. in the University of Michigan Museum of Art (UMMA) Commons (525 South State Street). This live broadcast of Face The Music will feature arwulf’s presentation of “Beyond The War Model." Â Accompanied by improvisation and creatively coordinated sounds from University of Michigan student musicians, arwulf will discuss lessons learned and concepts cultivated during more than thirty years’ involvement at WCBN. Since 1980, arwulf’s Face The Music has maintained its place atop the freeform radio world. Â Devoted listeners around the country and around the world tune in every Thursday evening to take in the eclectic and unpredictable world of Face the Music. Â arwulf’s study of American subcultures, Ann Arbor’s underground, traditional blues and jazz, and everything in between has enlightened and inspired our community for over thirty years. WCBN, the UofM student-run radio station and one of the longest-running freeform radio stations in the country, will broadcast live from the UMMA Commons on 88.3-FM in Ann Arbor as well as on its stream at www.wcbn.org. WCBN has broadcast from the University of Michigan campus continuously since 1952. Â Beginning as a collaboration of stations at East Quad, South Quad, and West Quad, the Campus Broadcasting Network was born as WCBN-AM 650. In 1977, WCBN found its current home at the far left of the FM dial. Â Since its inception, WCBN has emphasized alternative broadcasting — challenging what the medium of radio can do. 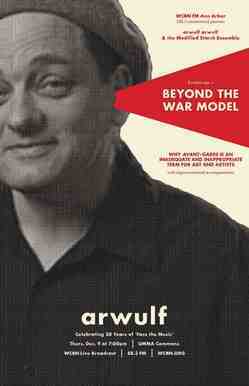 ‘Beyond The War Model’ will discuss why ‘avant garde’ is an inadequate and inappropriate term for art and artists. Â arwulf arwulf - who says, at age 13, “the name chose me and I accepted it” (Michigan Daily) — is a self-defined autodidact meaning that he is fully self-taught. Â The December 9th performance will draw from this great body of knowledge and experience in a candid discussion of our culture and language. Born Theodore Grenier, arwulf moved to Ann Arbor in 1968 at 11 years old.Â arwulf graduated from Earthworks High School, the short-lived predecessor to Community High, in 1974. Â A listener since the 1970’s, his own weekly freeform radio show began in 1980. In addition to Face the Music, arwulf has hosted “Sunday Best” on WEMU since 1986. “Sunday Best” studies traditional jazz, swing, and the blues. Â An active Facebook proclaims, “Arwulf Arwulf is the greatest Traditional Jazz DJ”. With the support of UMMA, WCBN is proud to present ‘Beyond The War Model’ as a free performance, open to the public. Â The Commons will be open for seating at 6:30 p.m. and the performance and live broadcast will begin promptly at 7 p.m.Â Guests are asked to enter through the Commons doors (on the Diag across from Mason Hall), or the Frankel Family Wing.